Erika is 13 years old and Tsubomi's classmate and neighbor and daughter of the owner of the fashion shop "Fairy Drop". In addition, she is the president of the Fashion Club. She loves fashion and designing her own clothing. She has a jealous complex towards her beautiful and fashionable older sister, who is a Charisma Model despite still being in high school. She is an energetic girl and bluntly says what she is thinking, although she also begins to change after meeting Tsubomi. She makes Tsubomi join the Fashion Club after all old members signed off. After she is informed the qualification of Pretty Cure, she agrees to help in the fight of Tsubomi. 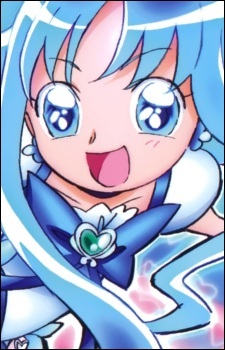 As Cure Marine, her theme color is light blue and her flower symbol is the Cyclamen. She has powers related to the ocean and can use auxiliary attacks such as Marine Shoot and Marine Dynamite in addition to her finishing attack. Her catchphrase is "Even my heart, that is wider than the sea, is at the limit of its patience!" (海より広いあたしの心も、ここらが我慢の限界よ！, Umi yori hiroi atashi no kokoro mo, kokora ga gaman no genkai yo!). Marine Shoot (マリンシュート, Marin Shūto): Cure Marine draws a circle of water drops before her before shooting them at the enemy. This is the first sub-attack that has been done two times.